Multiple Grammy Award-winning superstar Kelly Clarkson will perform the national anthem before the start of the 102nd Indianapolis 500 presented by PennGrade Motor Oil on Sunday, May 27 at the Indianapolis Motor Speedway. Clarkson will sing on Race Day in the traditional spot before the 33 drivers are called to their cars in front of the largest single-day spectator sporting event crowd in the world. Clarkson, a native of Fort Worth, Texas, first rose to fame in 2002 as the winner of the inaugural season of “American Idol.” She has grown to become one of the most popular artists of any era, with more than 100 No. 1 singles on all Billboard charts and total worldwide sales of more than 25 million albums and 36 million singles. She has won three Grammy Awards, four American Music Awards, three MTV Video Music Awards, two Academy of Country Music Awards, two American Country Awards and one Country Music Association Award. This will be the second time Clarkson has performed the anthem before the Indianapolis 500, as she also sang in 2011 with Seal while accompanied on piano by David Foster. She also is a coach on the 14th season of the hit TV singing competition, “The Voice,” which premiered in February. Follow Clarkson on Twitter @kelly_clarkson, on Instagram @kellyclarkson, on Snapchat at itsmekellyc and on YouTube at youtube.com/kellyclarkson. 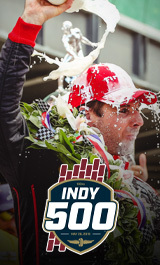 Visit IMS.com to purchase tickets for the 102nd Indianapolis 500 presented by PennGrade Motor Oil on Sunday, May 27 and for more information on the complete Month or May schedule at IMS. The race will be televised live on ABC, with the pre-race show starting at 11 a.m. (ET).